A supply curve shows how quantity supplied will change as the price rises and falls, assuming ceteris paribus, that is, no other economically relevant factors are changing. If other factors relevant to supply do change, then the entire supply curve will shift. Just as a shift in demand is represented by a change in the quantity demanded at every price, a shift in supply means a change in the quantity supplied at every price. In thinking about the factors that affect supply, remember what motivates firms: profits, which are the difference between revenues and costs. Goods and services are produced using combinations of labor, materials, and machinery, or what we call inputs (also called factors of production). If a firm faces lower costs of production, while the prices for the good or service the firm produces remain unchanged, a firm’s profits go up. When a firm’s profits increase, it’s more motivated to produce output (goods or services), since the more it produces the more profit it will earn. So, when costs of production fall, a firm will tend to supply a larger quantity at any given price for its output. This can be shown by the supply curve shifting to the right. Figure 1. 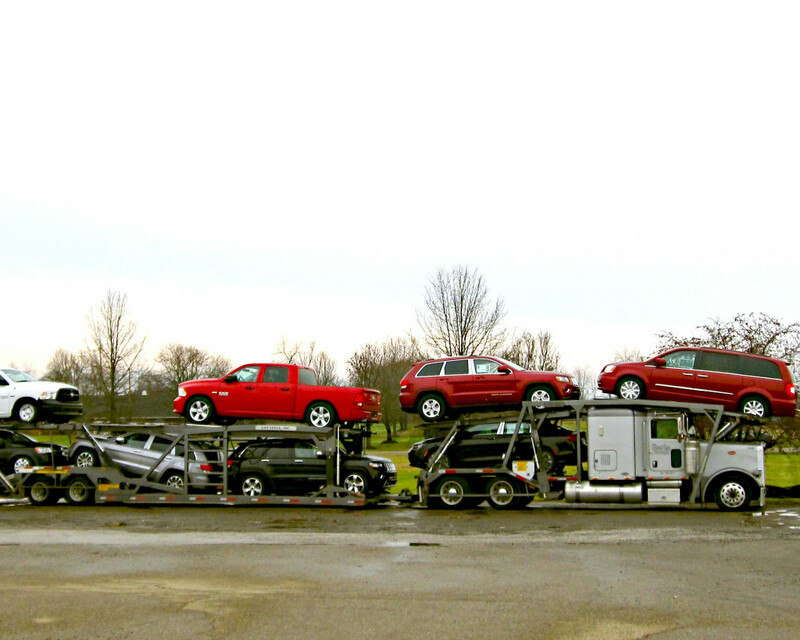 Shipping Cars. If production costs increase, the supply for cars and trucks will shift to the left. Take, for example, a messenger company that delivers packages around a city. The company may find that buying gasoline is one of its main costs. If the price of gasoline falls, then the company will find it can deliver packages more cheaply than before. Since lower costs correspond to higher profits, the messenger company may now supply more of its services at any given price. For example, given the lower gasoline prices, the company can now serve a greater area, and increase its supply. Consider the supply for cars, shown by curve S0 in Figure 2, below. Point J indicates that if the price is $20,000, the quantity supplied will be 18 million cars. If the price rises to $22,000 per car, ceteris paribus, the quantity supplied will rise to 20 million cars, as point K on the S0 curve shows. The same information can be shown in table form, as in Table 1. Figure 2. Shifts in Supply: A Car Example. Now imagine that the price of steel—an important component in vehicle manufacturing—rises, so that producing a car has become more expensive. At any given price for selling cars, car manufacturers will react by supplying a lower quantity. This can be shown graphically as a leftward shift of supply, from S0 to S1, which indicates that at any given price, the quantity supplied decreases. 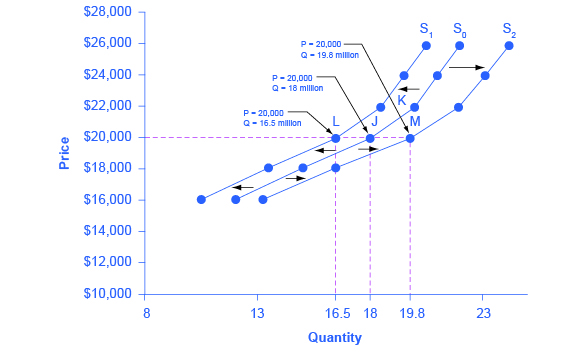 In this example, at a price of $20,000, the quantity supplied decreases from 18 million on the original supply curve (S0) to 16.5 million on the supply curve S1, which is labeled as point L.
We know that a supply curve shows the minimum price a firm will accept to produce a given quantity of output. What happens to the supply curve when the cost of production goes up? Following is an example of a shift in supply due to an increase in production cost. Figure 3. 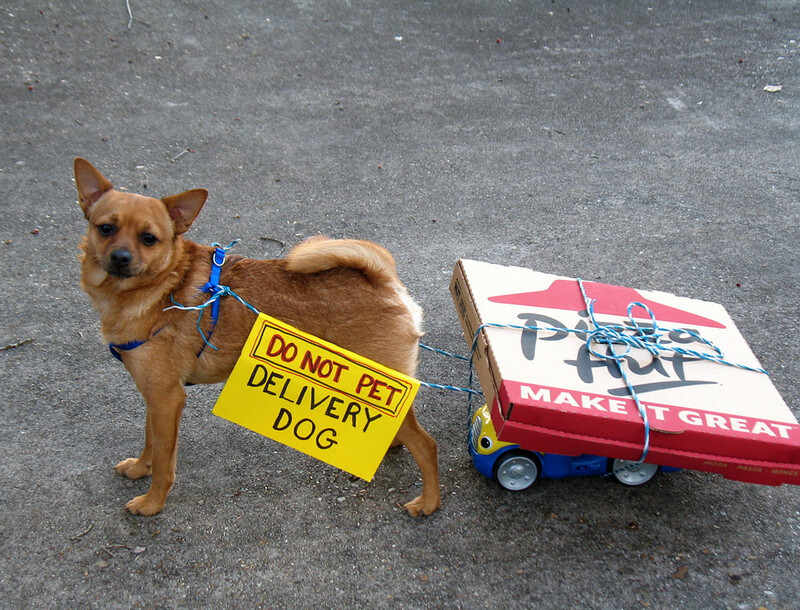 Delivery Options. Since this is not a realistic option for pizza suppliers, what happens to the supply curve when production costs increase? Step 1. Draw a graph of a supply curve for pizza. Pick a quantity (like Q0). If you draw a vertical line up from Q0 to the supply curve, you will see the price the firm chooses. An example is shown in Figure 4. Figure 4. Supply Curve. 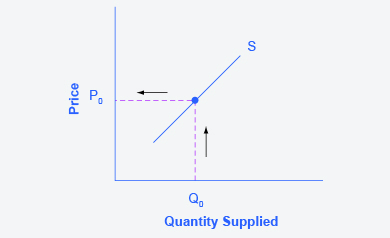 The supply curve can be used to show the minimum price a firm will accept to produce a given quantity of output. Step 2. Why did the firm choose that price and not some other? One way to think about this is that the price is composed of two parts. The first part is the average cost of production: in this case, the cost of the pizza ingredients (dough, sauce, cheese, pepperoni, and so on), the cost of the pizza oven, the rent on the shop, and the wages of the workers. The second part is the firm’s desired profit, which is determined, among other factors, by the profit margins in that particular business. If you add these two parts together, you get the price the firm wishes to charge. 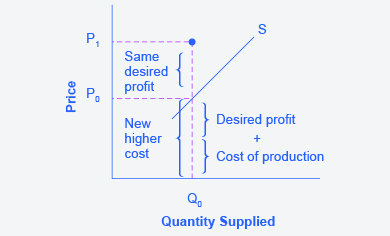 The quantity Q0 and associated price P0 give you one point on the firm’s supply curve, as shown in Figure 5. Figure 5. Setting Prices. The cost of production and the desired profit equal the price a firm will set for a product. Step 3. Now, suppose that the cost of production goes up. Perhaps cheese has become more expensive by $0.75 per pizza. If that is true, the firm will want to raise its price by the amount of the increase in cost ($0.75). Draw this point on the supply curve directly above the initial point on the curve, but $0.75 higher, as shown in Figure 6. Figure 6. Increasing Costs Lead to Increasing Price. 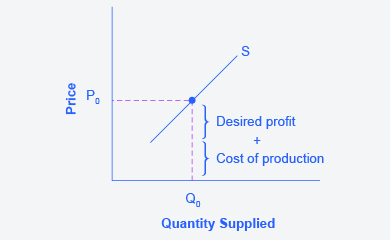 Because the cost of production plus the desired profit equal the price a firm will set for a product, if the cost of production increases, the price for the product will also need to increase. Step 4. Shift the supply curve through this point. 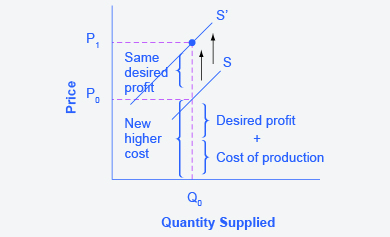 You will see that an increase in cost causes a leftward shift of the supply curve so that at any price, the quantities supplied will be smaller, as shown in Figure 7. Figure 7. Supply Curve Shifted Left. When the cost of production increases, the supply curve shifts leftward to a new price level. Figure 8. Field of Wheat. Especially good growing seasons and weather could lead to greater supply and a rightward shift in the supply curve. The cost of production for many agricultural products will be affected by changes in natural conditions. 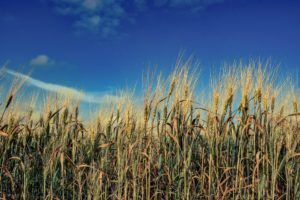 For example, the area of northern China that typically grows about 60 percent of the country’s wheat output experienced its worst drought in at least fifty years in the second half of 2009. A drought decreases the supply of agricultural products, which means that at any given price, a lower quantity will be supplied; conversely, especially good weather would shift the supply curve to the right. When a firm discovers a new technology that allows it to produce at a lower cost, the supply curve will shift to the right, as well. For instance, in the 1960s a major scientific effort nicknamed the Green Revolution focused on breeding improved seeds for basic crops like wheat and rice. By the early 1990s, more than two-thirds of the wheat and rice in low-income countries around the world was grown with these Green Revolution seeds—and the harvest was twice as high per acre. A technological improvement that reduces costs of production will shift supply to the right, so that a greater quantity will be produced at any given price. Government policies can affect the cost of production and the supply curve through taxes, regulations, and subsidies. For example, the U.S. government imposes a tax on alcoholic beverages that collects about $8 billion per year from producers. Taxes are treated as costs by businesses. Higher costs decrease supply for the reasons discussed above. Other examples of policy that can affect cost are the wide array of government regulations that require firms to spend money to provide a cleaner environment or a safer workplace; complying with regulations increases the cost of producing any level of output. A government subsidy, on the other hand, is the opposite of a tax. A subsidy occurs when the government pays a firm directly or reduces the firm’s taxes if the firm carries out certain actions. From the firm’s perspective, subsidies are an offset to costs; they essentially reduce the cost of production and increase supply at every given price, shifting supply to the right. Summary: What Factors Shift Supply? Changes in the cost of inputs, natural disasters, new technologies, taxes, subsidies, and government regulation all affect the cost of production. In turn, these factors affect how much firms are willing to supply at any given price. Figure 9 below summarizes factors that change the supply of goods and services. Notice that a change in the price of the product itself is not among the factors that shift the supply curve. Although a change in price of a good or service typically causes a change in quantity supplied or a movement along the supply curve for that specific good or service, it does not cause the supply curve itself to shift. Figure 9. Factors That Shift Supply Curves. (a) A list of factors that can cause an increase in supply from S0 to S1. (b) The same factors, if their direction is reversed, can cause a decrease in supply from S0 to S1.